Historical fiction is one of my favorite genres. A great historical fiction book invites the reader to learn about a time and place in history while experiencing it through the eyes of contemporaneous characters. 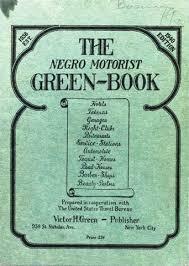 Pictured above is the cover of an actual copy of The Green Book. Another remarkable historical fiction picture book is Rose Blanche by Roberto Innocenti, which takes place during World War II in Germany. Though Rose sees the soldiers and swastikas all around her, she has little understanding of what is going on. One day, Rose witnesses a young boy escape from a truck. Though he is quickly captured and forced back into it. Rose follows the truck and discovers a nearby concentration camp. She begins sneaking food to the emaciated prisoners until the day the camp is liberated. Rose’s death on the last day she visits the camp is implied. Rose Blanche is a very moving story. It portrays a young girl’s effort to understand the inhumane treatment of human beings. 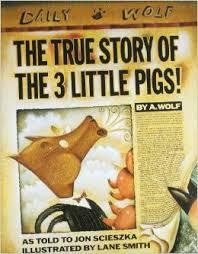 Though it is a picture book, the content is heavy and the ending is tragic. 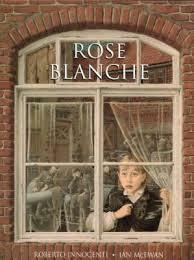 I would recommend Rose Blanche for students in grades 5 and up. Last summer as I reflected on my first year of teaching 5th grade, I considered the many skills and strategies that I wanted to weave into learning experiences throughout the year. Tackling unfamiliar vocabulary was something I knew would be helpful to all readers regardless of reading level, genre or unit of study. First of all, the plot is amazing. This is a story about the unlikely friendship between the Big Friendly Giant (BFG) and a clever young girl named Sophie. 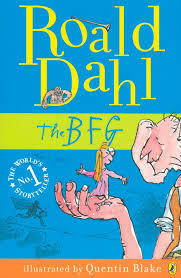 The BFG is an easily confused character, so the reader has to pay close attention to the text to make sense of what he is saying. Luckily, Sophie asks many questions to help clarify what is being said. 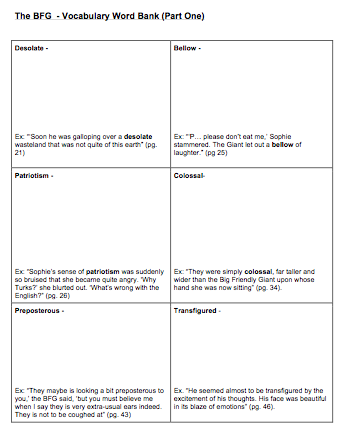 Since our Fantasy reading unit was not until May, I thought this would be a great way to preview the genre. Secondly, Dahl takes the opportunity to invent a lot of vocabulary for this story. For example as a vegetarian giant, the only thing the BFG eats is a disgusting vegetable called the snozzcumber. As I prepared to launch the read aloud of The BFG, it occurred to me to access the class’ previous knowledge of word solving strategies. So I opened it up to them. I asked, “What are some strategies that we already know to help us figure out the meaning of unfamiliar words?” Their answers were so strong and impressive that I charted them. 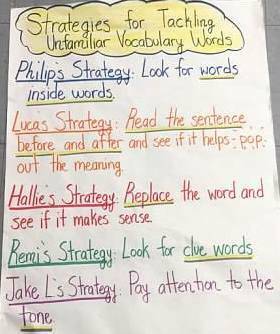 If they were able to name so many different strategies, why did they have a hard time using them? It turned out that they simply needed opportunities to practice using them. Each time we read The BFG, I made sure the chart was in our meeting area. By the time we reached the end of the book, these young learners had become much more confident word solvers. The chart remained up in our class for the rest of the school year, and students easily transferred these skills across genres and content areas. 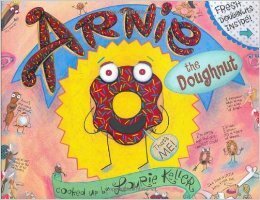 Arnie the Doughnut by Laurie Keller is easily one of the strangest picture books that I have read. But, the more I think about it, the more I like it. I was SO excited to read it to my class. I couldn’t wait to hear what they thought of it. When they described it as “funny but weird,” “cool but I don’t know” and “awesome,” I realized that this picture book was one that they would be thinking about for a long time. 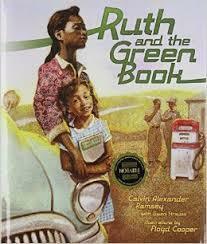 Following the read aloud, many of my students wanted to reread it independently. This also allowed them the chance to take a closer look at the detailed illustrations and captions that fill each page. The main character, Arnie, is a living, breathing doughnut. He is created in one best bakeries in town and is very proud of his 135 candy-colored sprinkles. It becomes clear right away that Arnie is not like the other doughnuts. When Mr. Bing picks him from the bakery case, Arnie is ecstatic. He can’t wait to meet his new owner. What Arnie does not realize is that doughnuts are meant to be eaten! When Mr. Bing tries to eat Arnie, he becomes outraged! Arnie “tricks” Mr. Bing into allowing him to call the bakery to alert all the other doughnuts. It turns out that they already know this and are okay with their destiny. (Pictured Below) Ultimately, Arnie refuses to accept that being eaten should be his purpose in life. Arnie the Doughnut (Guided Reading Level: R) is a book that I can read over and over again and notice different details each time. I’d recommend this book for students in grades 3-5, however younger readers will also be entertained by it. In addition to the picture book, there is an Arnie the Doughnut chapter book series (Guided Reading Level: Q & R) available, which would be great for 3rd and 4th graders.